4Media FLV to WMV Converter is the professional FLV to WMV converter software which can convert FLV videos to Windows media files including WMV, ASF videos and WMA, WAV, MP3 audios for playing on Windows media players and Windows mobile devices. If you want to watch the FLV videos downloaded from the internet on Windows media players, then 4Media FLV to WMV Converter is the right choice for you. 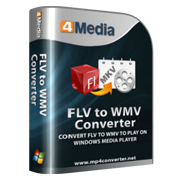 This FLV to WMV converter software can convert FLV files to Windows media files including WMV, ASF, WMA, WAV and MP3, e.g. convert FLV to WMV, FLV to WMA. To make the FLV videos satisfy your special demand, you can apply changes to the output file like splitting/trimming file, managing power, compressing file size, adjusting resolution, bit rate, frame rate and more parameters. Download 4Media FLV to WMV Converter for a free trial to get amazing FLV files to play on PC, Xbox, Zune and Windows Mobile devices! To make FLV videos played on Windows media players, this FLV to WMV converter helps you convert FLV files to WMV, ASF. Extract WMA, MP3, WAV audios from FLV videos for listening, e.g. FLV to WMA. Auto detect CPU configuration, and process one task with multi-core CPU. The core number for processing conversion can be selected. Convert multiple FLV files to WMV or WMA at the same time in one click with batch process and multithreading. Provide rich adjusted profile parameters: resolution, bit rate, frame rate, split mode, etc. to output custom files. Change the parameters of a profile to save as a new one. The profile list is sorted by different types. Set many output formats like WMV/ASF/WMA for one source file, and get them all converted in a single click. Set the start time and duration of the segment to convert when converting FLV to WMV. The Bitrate Calculator tool calculates video bit rate according to the size you enter, thus you can compress the FLV video to the wanted size. 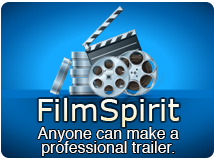 Choose a split mode or customize split size or time, then let the FLV to WMV converter split the file into several ones automatically. Preview FLV videos before conversion and take a snapshot at any time when previewing. The player can be switched to be stand-alone with adjustable aspect ratio (4:3 and 16:9). Setting the FLV to WMV converter run in background can spare CPU resource for other running programs. With the after done action set as shutdown, hibernate, standby or exit, you don't need to wait for the conversion to the end. 4Media FLV to WMV Converter provides multiple interface languages: German, Japanese, English, French and Chinese. How to convert FLV files to WMV, WMV format?